HIV-1 establishes latency primarily by infecting activated CD4+ T cells that later return to quiescence as memory cells. Latency allows HIV-1 to evade immune responses and to persist during antiretroviral therapy, which represents an important problem in clinical practice. The lack of a valid cellular model to study HIV-1 latency has hindered advances in the understanding of its biology. In this study, we attempted to model HIV-1 latency using human primary CD4+ T cells infected in vitro with HIV-1 after activation with Ag-loaded dendritic cells and then brought back to quiescence through a resting phase in the presence of IL-7. During the resting phase, expression of cellular activation markers disappeared and cell proliferation and viral replication ceased, but resumed following restimulation of rested cells with Ag or mAbs directed to CD3/CD28. In addition, higher cell death rates were observed in HIV-1-infected than uninfected cultures during secondary but not primary stimulation. Thus, this system may allow us to study the biology of HIV-1 latency, as well as the mechanisms of CD4+ T cell death following HIV-1 reactivation. Although highly active antiretroviral therapy (HAART)2 suppresses viral replication to undetectable levels, HIV-1 continuously replicates throughout the course of the infection (1). However, HIV-1 also establishes a status of nonproductive infection known as viral latency. Harper et al. (2) reported that cells harboring the provirus in clinical samples were found at frequency considerably higher than cells expressing viral RNA, thus providing the first indirect evidence for the existence of latently infected cells in HIV-1 patients. Formal demonstration came from Siliciano and colleagues (3), who detected integrated, latent HIV-1 genome in resting peripheral blood CD4+ T cells of HIV-1 patients. Latently infected cells persist in HAART-treated patients with undetectable viremia, and HIV-1 can be rescued in vitro from the cells of these patients (4, 5, 6). The rate of decay for the latently infected pool has been calculated at 44 mo, sufficiently slow to guarantee lifelong persistence and to preclude HIV-1 eradication with HAART (7). Moreover, as a dormant provirus, HIV-1 is invisible to cellular and humoral immune responses and resistant to drugs interfering with its life cycle (8). HIV-1 establishes latency by exploiting the cellular events of CD4+ T cell blast transformation, clonal expansion, and clonal contraction that lead to the formation of immunological memory (for a comprehensive review, see Refs. 9 and 10). During the contraction phase at the end of the immune response, the vast majority of activated CD4+ T cells die in response to intrinsic mechanisms triggered by Ag withdrawal and consequent decline of growth factors and Bcl-2, as well as extrinsic mechanisms involving Fas (CD95)-Fas ligand (CD178) interaction and caspase 3 activation (11). Production of IL-7 during the contraction phase promotes the establishment and maintenance of immunological memory through the up-regulation of Bcl-2 expression, which counteracts the intrinsic pathway of activated CD4+ T cell apoptosis (10, 12, 13). HIV-1 typically infects cells during blast transformation and clonal expansion (14, 15). Although the majority of HIV-1-infected lymphoblast CD4 cells die as a consequence of apoptosis or cytopathic effects of HIV-1, some infected cells survive clonal contraction and return to the resting state as memory cells bearing an integrated HIV-1 genome. In their resting state, HIV-1-infected cells do not actively replicate the virus, which remains dormant for extended periods of time (16, 17). Viral production resumes following Ag-driven or homeostatic proliferation and cytokine stimulation. Currently, the study of HIV-1 latency relies primarily on clinical samples and chronically infected cell lines, which present severe limitations such as the very low frequency of latently infected cells in the former and the lack of physiological relevance of the latter (for a review see Ref. 8). In addition, systems based on the use of clinical samples allow us to study HIV-1 reactivation from latency, but not how latency is established. In this study, we provide proof of concept that resting nonproductively infected CD4+ T cells carrying a replication-competent HIV-1 genome can be generated in vitro after Ag-driven proliferation. This system may help shed light into the mechanisms of HIV-1 latency and lead to identify new therapeutic strategies. Peripheral blood was obtained from HIV-1-negative volunteers after approval by the Institutional Review Board of the University of Maryland, Baltimore, and with signed informed consent forms. PBMC were isolated by Ficoll-Paque (GE Healthcare) centrifugation and washed three times in PBS (Invitrogen). Monocytes were enriched by negative selection from freshly isolated PBMC using a Monocyte Isolation Kit (Miltenyi Biotec). Enriched monocytes were suspended in RPMI 1640 (Invitrogen) and subjected to a second round of enrichment by adhesion on plastic at 37°C. After 2 h, cultures were washed to remove nonadherent cells. For the generation of immature monocyte-derived dendritic cells (MDDC), adherent cells were cultured for 5 days in MDDC medium consisting of RPMI 1640 supplemented with 1% nonessential amino acids, 1% sodium pyruvate, 50 μM 2-ME, 50 μg/ml gentamicin (all from Invitrogen), 10% human serum AB (Gemini Bioproducts), 50 ng/ml GM-CSF and 50 ng/ml IL-4 (both from R&D Systems), with a 50% medium change at day 3. Monocytes and MDDC were analyzed by flow cytometry (FCM) using anti-CD14, CD86, and HLA-DR Abs (see below). Naive CD4+ T cells were enriched by negative selection from freshly isolated PBMC using a naive CD4+ T cell isolation kit (Miltenyi Biotec). Enriched cells were mixed with MDDC at a 10:1 ratio and cultured in MDDC medium containing 250 ng/ml staphylococcal enterotoxin B (SEB; Sigma-Aldrich) and 25 U/ml IL-2 (Roche Biochemicals). After 4 days, activated cells were harvested, washed, and suspended in RPMI 1640 and then infected with 2 × 103 tissue culture infective dose 50 per 106 cells of gradient-purified HIV-1IIIB (Applied Biosystems) for 2 h at 37°C. Finally, the cells were washed three times to remove cell-free virus, plated at 0.5 × 106 cells/ml in fresh MDDC medium containing 25 U/ml IL-2, and cultured for 10–15 days. Every 2–3 days, fresh MDDC medium plus IL-2 was added to bring the cell concentration back to 0.5 × 106 cells/ml. At each step, cells were analyzed by FCM with anti-CD3, CD4, CD25, CD45R0, CD45RA, CD62L, CD69, HLA-DR, and Ki-67 Abs. In addition, diploidy was analyzed by intracellular staining with 7-aminoactinomycin D (7AAD; BD Biosciences). Memory CD4+ T cells were enriched by negative selection from 10- to 15-day cultures of HIV-1-infected and uninfected CD4+ T lymphoblasts using a memory CD4+ T cell isolation kit (Miltenyi Biotec). Highly enriched cells were then cultured in RPMI 1640 supplemented with 10% human serum AB and 1 ng/ml IL-7 (R&D Systems) for up to 30 days. For reactivation of HIV-1 replication, rested cells were stimulated with SEB-loaded dendritic cells as described above. Alternatively, rested cells were plated in tissue culture wells coated overnight with 1 μg/ml anti-CD3 (OKT3) and CD28 (CD28.2; Beckman Coulter) in PBS at 4°C and cultured in the presence of 25 U/ml IL-2. Where indicated, cells were cultured in the presence of 10 μg/ml cycloheximide (CHX; Sigma-Aldrich) or 1 μM azidothymidine (AZT; Sigma-Aldrich). For surface staining, 2.5 × 105 cells were washed with 1 ml of 2% human serum AB in PBS and suspended in 200 μl of the same buffer containing 2–5 μl of the appropriate CD-specific or isotype control Ab. After 30 min on ice in the dark, cells were washed twice with the same buffer and fixed in 1% paraformaldehyde (Sigma-Aldrich) in PBS. For intracellular detection of HIV-1, we used the anti-p24gag KC57 Ab (Beckman Coulter) according to the instructions of the manufacturer. For intracellular detection of Ki-67 and determination of diploidy, cells were fixed and permeabilized with a Cytofix/Cytoperm Kit from BD Biosciences, then stained with the appropriate Ab or with 7AAD. All Abs were from BD Biosciences, except for the anti-p24gag KC57 Ab, which was obtained from Beckman Coulter. Stained cells were acquired with a FACSCalibur flow cytometer using CellQuest software (both from BD Biosciences). FCM data were analyzed with FlowJo (Tree Star). For extracellular HIV-1 p24gag Ag ELISA, aliquots of the culture supernatant were collected, rendered 0.5% with Triton X-100 and 0.002% with sodium azide, and stored at −20°C until analysis. For intracellular ELISA, 105 cells were harvested, washed with PBS, pelleted, and lysed in 0.5% Triton X-100/0.002% sodium azide in PBS and stored at −20°C until analysis. Samples were then analyzed using an ELISA kit from NEN Life Sciences (PerkinElmer). The lower limit of detection of this kit is 6.25 pg/ml. All ELISA were performed by the μQuant Facility of the Institute of Human Virology. The model of HIV-1 latency we have developed recapitulates in vitro the events of blast transformation, clonal expansion, and clonal contraction leading to the generation of resting, memory cells. It consists of four steps (Fig. 1⇓A): 1) generation of dendritic cells from primary monocytes (MDDC), 2) activation of naive CD4+ T cells with MDDC and Ag, 3) HIV-1 infection and expansion of activated CD4+ T cells, and 4) generation of resting, nonproductively infected cells. The activation and expansion of naive CD4+ T cells with MDDC is a modification of a published method (18). A fifth step involves the reactivation (secondary stimulation) of resting, nonproductively infected cells with either MDDC plus SEB or immobilized anti-CD3/CD28 Abs leading to rescue of latent provirus. For consistency, all results shown below were obtained with cells from the same individual donor in the course of the same experiment (unless otherwise indicated) and are representative of results obtained with more than five donors. Enrichment of naive CD4+ T cells and activation with dendritic cells. A, Experimental procedure for the generation of resting nonproductively, infected CD4+ T cells. B, FCM analysis of naive CD4+ T cells enriched by negative selection from PBMC. 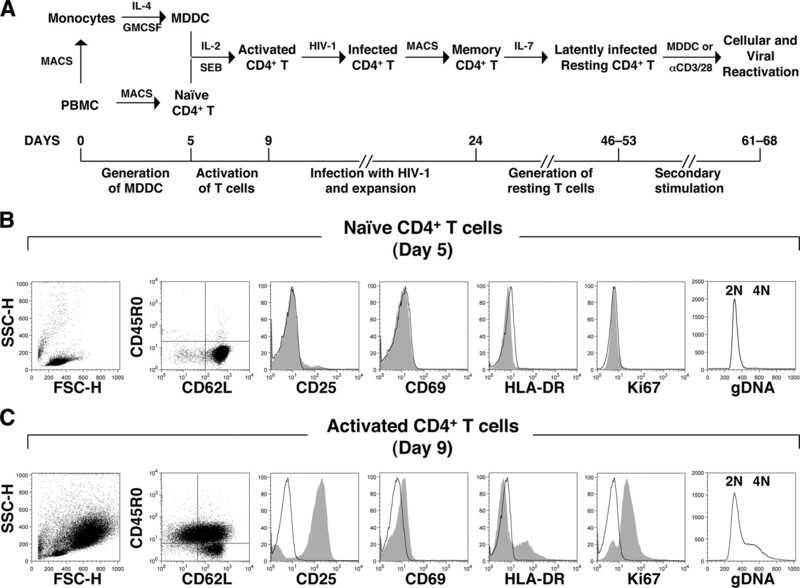 C, FCM analysis of CD4+ T cells after activation with MDDC. All plots (except for forward light scatter height (FSC-H) vs side light scatter height (SSC-H)) are gated in the live cell population as determined by FSC and SSC profiles and exclusion of 7AAD. The days of analysis reported in both panels match the time scale reported in A. Results are representative of more than 20 different donors. First, we isolated monocytes by negative selection from fresh PBMC of HIV-1-negative donors. These cells expressed high CD14 and low CD86 (data not shown), indicating strong Ag capture function, but poor Ag presentation and T cell costimulation function. Following a further enrichment step by adherence to eliminate contaminating lymphocytes, we induced differentiation of adherent monocytes into dendritic cells (MDDC) with IL-4 and GM-CSF. Immature MDDC displayed increased size and granularity, low CD14 and high CD86 expression (data not shown), and thus possessed strong Ag presentation and T cell costimulation properties. Next, we enriched naive CD4+ T cells by negative selection from fresh PBMC of the same donor, yielding naive cells at a purity consistently ≥95% (Fig. 1⇑B). As expected, these cells did not express activation markers and displayed a diploid genomic DNA content, indicating absence of ongoing DNA synthesis (Fig. 1⇑B). All preparations of naive CD4+ T cells contained a small population of CD25+ cells (median frequency, 4%; minimal, 1%; maximum, 10%; n = 13). These cells expressed lower CD127 levels compared with the main CD25− population and were dimly positive for the transcription factor FoxP3 (data not shown). Based on these features, we concluded that the population of CD25+ cells contained CD4+CD45RA+CD127lowFoxP3low natural naive regulatory cells described previously (19, 20). Naive cells were activated by coculture with autologous MDDC and Ag. To achieve T cell responses of sufficient magnitude to sustain measurable levels of HIV-1 replication, we used the superantigen SEB instead of nominal protein Ags. Fig. 1⇑C demonstrates that by day 4 after stimulation (that is day 9 of the entire procedure according to the time scale shown in Fig. 1⇑A), a high percentage of cells had undergone blast transformation, as shown by FSC and SSC profiles in FCM. In addition, entry in the cell cycle was evidenced by up-regulation of activation markers, changes in the expression pattern of CD45R0 and CD62L, and replication of genomic DNA (Fig. 1⇑C). Since CD69 is an early and transient activation marker, by day 4 in culture its expression was already declining as shown in Fig. 1⇑C. Thus, we were able to induce activation and proliferation of a large population of naive CD4+ T cells using autologous MDDC that provide important costimulatory signals. We infected the CD4+ T lymphoblasts with HIV-1 4 days after stimulation (day 9 of the entire procedure) and followed viral replication for 15 days after infection (up to day 24 of the procedure) by intra- and extracellular p24gag Ag ELISA. As shown in Fig. 2⇓A, 10 days postinfection (day 19 of the procedure) HIV-1 p24gag Ag was detectable in the culture supernatant and inside the cells and increased markedly through day 24. Intracellular FCM analyses paralleled these results and indicated that the frequency of productively infected cells at the end of the 15-day infection period (day 24 of the procedure) was 5–10% (Fig. 2⇓B). Importantly, since the infection was conducted at a low multiplicity of infection (0.002), viral replication did not significantly affect cell viability, as shown by the high percentage of live cells in infected cultures (Fig. 2⇓A). HIV-1 replication during the phase of cell expansion. A, Intracellular and extracellular HIV-1 p24gag levels in whole-cell extracts (•) and culture supernatants (▪), respectively. Cell viability (percentage of live cells) determined by trypan blue exclusion is also shown in this panel (⋄, uninfected cultures; ♦, infected cultures). B, Intracellular FCM analysis of HIV-1 p24gag Ag in infected and uninfected cultures. All FCM plots are gated in the live cell population as determined by FSC and SSC profiles and exclusion of 7AAD. The days of analysis reported in both panels correspond to the time scale reported in Fig. 1⇑A. Results are representative of 10 different donors. Next, we sought to generate resting cells from HIV-infected, CD4+ T cell cultures. At day 24 of the procedure, we enriched activated (memory-phenotype) CD4+ T cells by negative selection to eliminate naive cells unresponsive to SEB (Fig. 3⇓A). Expression of CD25 and Ki-67 and genomic DNA content >2 N indicated that the enriched cell population comprised activated cells still progressing through the cell cycle (Fig. 3⇓A). Then, enriched cells were cultured with IL-7 and allowed to rest for up to 4 wk (up to day 53 of the procedure). Pilot experiments (data not shown) indicated that IL-7 at the dose used in our system did not induce proliferation compared with untreated cultures. However, IL-7 had a protective effect against cell death caused by growth factor withdrawal and promoted a faster return to quiescence, consistent with previous reports (12, 13). Resting phases shorter than 2 wk achieved cell quiescence as determined by lack of proliferation and most activation markers, although CD25 required 4 wk to disappear completely. However, short rest phases did not achieve complete suppression of viral replication (data not shown). Throughout the phase of clonal contraction, we monitored forward and side light scatter profiles, expression of activation markers, and genomic DNA content. All of these parameters indicated that at the end of the resting phase, cells had returned to quiescence (Fig. 3⇓B). After a typical 21- to 28-day resting phase, the yield of viable cells varied from donor to donor, averaging 20% of the starting number (range, 5–30%, n = 6; data not shown). Interestingly, Fig. 3⇓A shows that the memory-phenotype cells isolated by negative selection at the end of the expansion phase (day 24 of the procedure) comprised both CD62L+ and CD62L− cells. On the contrary, at the end of the resting phase (day 53 of the procedure), all cells were CD62L+ and expressed the lymphoid tissue homing marker CCR7 (Fig. 3⇓B). Previous studies have shown that CD45R0+CD62L+CCR7+ cells belong predominantly to the long-lived central memory T (TCM) cell subset (21). Thus, in our system CD62L− cells die and disappear in the course of the resting phase, whereas cells with a phenotype similar to long-lived TCM cells survive and return to quiescence. It has also been reported that IL-7-treated resting cells display a larger size than untreated resting cells (22). Indeed, we found that resting CD4+ T cells cultured in the presence of IL-7 showed larger size and increased granularity than freshly isolated naive CD4+ T cells (average FSC-H value: 397 ± 19.5 vs 276 ± 37.4; average SSC-H value: 111 ± 10.7 vs 72 ± 10.2, respectively; n = 11, p < 0.001 for both parameters). Enrichment of activated (memory-phenotype) CD4+ T cells and generation of resting cells. A, FCM analysis of activated (memory-phenotype) CD4+ T cells enriched by negative selection from CD4+ T cells and MDDC cultures. B, FCM analysis of rested CD4+ T cells. All plots (except for FSC-H vs SSC-H plots) are gated in the live cell population as determined by FSC and SSC profiles and exclusion of 7AAD. The days of analysis reported in both panels correspond to the time scale reported in Fig. 1⇑A. Results are representative of more than 10 different donors. We also monitored viral replication during the resting phase by assaying intra- and extracellular levels of HIV-1 p24gag Ag. Intracellular p24gag levels normalized by cell number decreased during the course of the resting phase (Fig. 4⇓A). Moreover, we did not detect p24gag accumulation in the culture supernatant after the first 7 days of resting (day 31 of the procedure; Fig. 4⇓A). In independent experiments conducted with cells of three other volunteers, we found similar intracellular p24gag levels in resting cultures containing the protein synthesis inhibitor CHX (10 μg/ml), the nucleoside analog reverse transcriptase inhibitor AZT (1 μM) and in untreated cultures (Fig. 4⇓B; ▴, □, and •, respectively). These results demonstrate that intracellular p24gag entirely reflects protein synthesized during the expansion phase and undergoing slow degradation during the resting phase, rather than the product of low-level viral replication. The decline in intracellular p24gag detected by ELISA was consistent with intracellular FCM analysis showing a decline in HIV-1 p24gag-positive cells (Fig. 4⇓C). These results demonstrate the absence of active viral replication in these cells and indicate that the HIV-1 Ags detectable inside the cells were synthesized during the expansion phase and were undergoing degradation during the resting phase. In summary, these results indicate that we were able to induce cell quiescence and viral latency, obtaining resting cells in a state of nonproductive infection. Suppression of HIV-1 replication during the resting phase. A, Intracellular and extracellular HIV-1 p24gag levels in whole-cell extracts (•) and culture supernatants (▪), respectively. The • and ▪ at day 24 refer to the intracellular and extracellular p24gag levels measured immediately before enrichment of activated (memory-phenotype) CD4+ T cells (see also Fig. 3⇑A). B, Effect of CHX and AZT on the intracellular levels of p24gag Ag during the resting phase. ▴, CHX-treated cultures; □, AZT-treated cultures; •, untreated cultures. C, Intracellular FCM analysis of HIV-1 p24gag Ag in infected and uninfected cultures. All FCM plots are gated in the live cell population as determined by FSC and SSC profiles and exclusion of 7AAD. The days of analysis reported in all panels correspond to the time scale reported in Fig. 1⇑A. Results are representative of 5–10 different donors. Finally, we tested whether HIV-1-infected cultures that had been rested for up to 3–4 wk would resume HIV-1 replication following secondary stimulation. As indicated above, at the end of the resting phase, the yield of viable cells averaged 20% and ranged from 5 to 30%. High frequency of dead cells may represent a confounding factor in analyses performed during secondary stimulation. Thus, at the end of the resting phase (day 53 of the procedure), we eliminated dead cells from both HIV-1-infected and control cultures by Ficoll centrifugation, yielding cell populations with >98% viability as determined by trypan blue exclusion (data not shown). These cells were then cultured for 15 days (days 53–68 of the procedure) with MDDC and SEB as described above or in the presence of immobilized anti-CD3 and anti-CD28 Abs. Fig. 5⇓A shows that HIV-1 replication, as monitored by p24gag Ag ELISA, resumed as a consequence of cell restimulation. HIV-1 replication and cell viability during secondary stimulation with MDDC and anti-CD3/CD28 Abs. A, HIV-1 p24gag levels in whole-cell extracts (circles and triangles) and culture supernatants (squares and diamonds), respectively. B, Cell viability in HIV-1 infected (○ and ▵) and control uninfected cultures (□ and ⋄) are shown as percentage of live cells determined by trypan blue exclusion. In both panels, □ and ○ represent samples stimulated with MDDC and ⋄ and ▵ represent samples stimulated with anti-CD3/CD28. The days of analysis shown in all panels correspond to the time scale reported in Fig. 1⇑A. Results are representative of five different donors. Since HIV-1 replication did not affect cell viability during primary stimulation (see Fig. 3⇑A), we sought to determine whether reactivation of HIV-1 replication from nonproductively infected cells during secondary stimulation affected the rate of CD4+ T cell death. As shown in Fig. 5⇑B, cell viability in HIV-1- infected cultures declined more sharply than in the uninfected cultures following secondary stimulation with either MDDC or immobilized anti-CD3/CD28 Abs. Thus, these data show that replication competent virus can be rescued from nonproductively infected cells in the course of secondary stimulation. During this process, the rate of cell death in infected cultures markedly exceeds that observed in uninfected cultures, suggesting that this in vitro model may also be suitable to investigate the mechanisms of HIV-1-driven T cell death, both direct (in infected cells) and indirect (in uninfected, bystander cells). The FCM data in Fig. 4⇑C indicate that a small proportion of resting cells retains detectable intracellular HIV-1 p24gag throughout the resting phase. This observation raises the possibility that reactivation of HIV-1 replication during secondary stimulation (as shown in Fig. 5⇑A) derives only from that small percentage of cells that remains positive for HIV-1 p24gag even after a prolonged resting phase and not from cells that have lost expression of viral Ags while carrying the HIV-1 provirus. To address this question, we conducted the secondary stimulation in the presence or absence of AZT. In the experiment shown in Fig. 6⇓, which was conducted with cells of a donor different from the one shown throughout this study, but under the same culture conditions, the fraction of cells positive for HIV-1 as detected by FCM was ∼2% at the end of the expansion phase (Fig. 6⇓A, upper plot). Following the resting phase, the percentage of p24gag-positive cells decreased to background levels (<0.1%; Fig. 6⇓A, lower plot). When these cells were subjected to secondary stimulation with Ag-loaded MDDC, we observed a progressive increase in p24gag-positive cells (Fig. 6⇓B, top row). This was paralleled by an accumulation of p24gag Ag in the culture supernatant (Fig. 6⇓C, •). Cultures reactivated in the presence of AZT initially showed a percentage of HIV-1 p24gag-positive cells similar to that observed at the end of the expansion phase (compare the upper plot in Fig. 6⇓A with the first plot in the lower row of Fig. 6⇓B). However, at subsequent time points, cultures containing AZT showed a percentage of p24gag-positive cells close to background levels (∼0.2%). At the same time, we did not observe any accumulation of p24gag Ag in the supernatant of cultures containing AZT (Fig. 6⇓C, ▪). Thus, reactivation of HIV-1 replication during secondary stimulation derives from HIV-1-infected cells, regardless of the residual presence inside the cells of viral Ags. Moreover, the presence of antiviral drugs does not affect initial reactivation of latent provirus. Indeed, the percentage of HIV-1-positive cells observed at day 48 of the procedure closely approximates that observed at the end of the expansion phase. The complete disappearance of p24gag-positive cells at subsequent time points suggests that, although existing HIV-1-infected cells die as a consequence of cellular and viral reactivation, the presence of AZT prevents new productive infections to occur, yielding a net decline in p24gag-positive cells. Analysis of HIV-1 replication during secondary stimulation. A, Intracellular FCM analysis of HIV-1 p24gag Ags at the end of the expansion and resting phases (upper and lower plots, respectively). B, Intracellular FCM analysis of HIV-1 p24gag Ag during secondary stimulation with Ag-loaded MDDC in the absence and presence of 1 μM AZT (plots in the upper and lower rows, respectively). 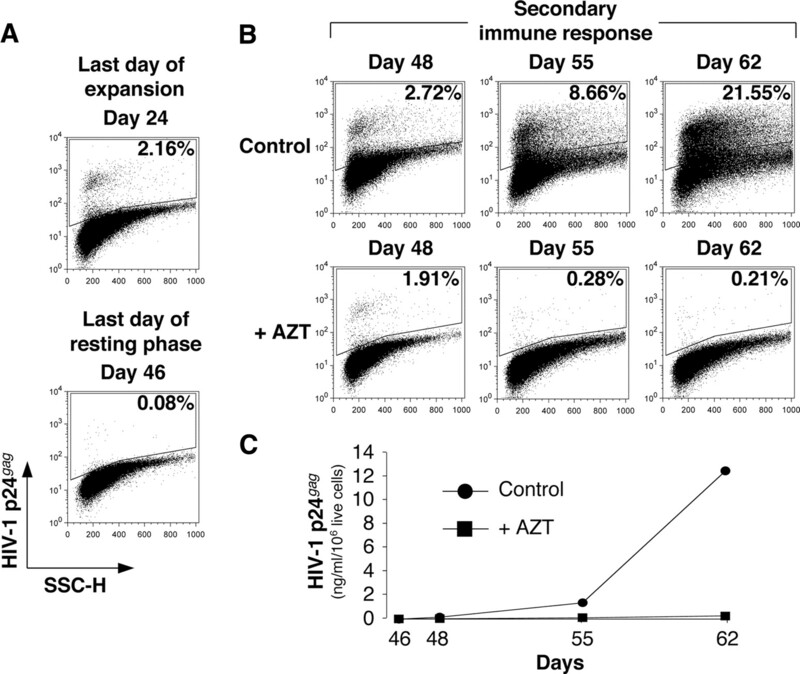 C, HIV-1 p24gag levels in culture supernatants during secondary stimulation with Ag-loaded MDDC in the absence or presence of 1 μM AZT (• and ▪, respectively). All FCM plots are gated in the live cell population as determined by FSC and SSC profiles and exclusion of 7AAD. The days of analysis reported in all panels correspond to the time scale reported in Fig. 1⇑A. We developed a culture system to recapitulate in vitro the establishment and reactivation of HIV-1 latency. Our model relies on primary human CD4+ T cells activated in response to stimulation with MDDC and infected in vitro with HIV-1. The infected cultures are then returned to a quiescent status by removal of Ag and addition of IL-7. Although high doses of IL-7 were shown to rescue HIV-1 from resting CD4+ T cells of patients under HAART therapy (23), in the present study we used low doses of IL-7 to counter cell death due to withdrawal of growth factors without inducing cell activation and proliferation or viral replication (12, 13). We demonstrated that quiescent, nonproductively infected cells obtained with this procedure lack cell surface activation markers and cell cycle markers, do not synthesize DNA, do not proliferate, and do not replicate HIV-1. Indeed, we demonstrated that p24gag Ag within infected cells represents protein expressed during the expansion phase and undergoing slow degradation during the resting phase without any de novo production. This is consistent with previous reports showing that resting cells present a highly nonpermissive environment for viral replication due to lack of critical transcription factors that require cell activation for proper function (24, 25, 26). Two recent studies presented evidence in support of the high stability of p24gag both in vivo and in vitro (27, 28). In our study, we also showed that only CD45R0+CD62L+CCR7+ cells, which in vivo represent predominantly long-lived TCM cells (21), survive through the resting phase and return to quiescence. In contrast, CD45R0+CD62L−CCR7+ cells, that are phenotypically similar to short-lived effector memory cells (21), disappear. All parameters of cell activation and proliferation and viral replication resumed following restimulation with either MDDC or immobilized Abs directed against CD3 and CD28. We also found that during secondary stimulation CD4+ T cell viability declined more sharply in HIV-1-infected than in uninfected cultures, although no significant difference was observed during primary stimulation. Current studies are aimed at assessing whether higher rates of cell death within infected cultures affect HIV-1-positive cells or uninfected, bystander cells, as well as at addressing the mechanisms underlying these phenomena. Finally, we demonstrated that reactivation of HIV-1 replication during secondary stimulation occurs from HIV-1-infected CD4+ T cells, regardless of whether p24gag Ag is still detectable in their cytoplasm at the end of the resting phase. Early in situ hybridization studies showed that cells harboring the HIV-1 provirus were found at higher frequency than cells expressing HIV-1 mRNA, providing indirect evidence of HIV-1 latency (2). However, only in the last decade Siliciano and colleagues (3, 4) demonstrated conclusively the existence of a pool of latently infected cells by showing that unstimulated, resting CD4+ T cells from HIV-1 patients did not replicate HIV-1 in vitro, but carried integrated provirus, which could be rescued after cell activation (5). Viral latency is the consequence of HIV-1 tropism for CD4+ T cells and the cellular mechanisms that establish immunological memory. Although viral latency does not affect the natural history of HIV-1 infection, it plays a critical role in clinical practice. Indeed, a pool of latently infected cells persists even under successful antiretroviral therapy (6, 7), with a decay rate of 44 mo that guarantees lifetime persistence of the virus (7). Moreover, the latent reservoir archives drug-resistant viruses that emerge in the context of inadequate therapy or poor compliance (29). Thus, latency influences therapeutic strategies (30) and represents a major obstacle to virus eradication. Margolis and colleagues (31, 32, 33) demonstrated the role of the human factors YY1 and LSF in suppressing viral transcription and establishing latency through recruitment of HDAC1 to the HIV-1 promoter. However, the mechanisms involved in the establishment and reactivation of latency remain to be elucidated, primarily for the lack of a suitable cellular system. The very low frequency of latently infected cells in clinical samples and the lack of known distinctive markers represent major drawbacks for this approach (8). Moreover, clinical samples are limited to the study of reactivation of latent provirus, which can be difficult, and different approaches are still under evaluation (3, 34, 35, 36, 37, 38). Several laboratories have established in vitro models of HIV-1 latency involving the use of chronically infected cell lines with minimal constitutive but inducible HIV-1 gene expression (e.g., ACH2, U1, JΔK) and clonal cell lines derived after transduction with engineered viral vectors (e.g., J-Lat; Refs. 39, 40, 41, 42). Although these models afford a reliable supply of latently infected cells to investigate both establishment and reactivation of latency, they lack the physiological relevance of systems based on primary cells. Under conditions of constitutive cellular activation and proliferation, latency may be the consequence of proviral integration within heterochromatic regions of the host genome (42), whereas in vivo HIV-1 integrates primarily within transcription-active regions (43). This suggests that different mechanisms of latency may be called into play under cellular and genomic environments so diverse. Thus, an ideal model should comply with both the requirement of viral latency and cellular quiescence, which is best afforded by systems that rely on primary cells. Recent studies reported the generation of latently infected cells through infection of resting CD4+ T cells that were either unstimulated or that had been pretreated with the CCR7 ligands CCL19 and CCL21 (44, 45). In that report, stimulation with CCL19 and 21 did not induce expression of activation markers and did not promote cell proliferation, but led to high rates of proviral integration despite low levels of viral replication. Upon cell stimulation, a marked increase in viral production was detected (45). HIV-1 infection of resting cells in vivo is characterized by entry and reverse transcription, but not integration and production of viral progeny; thus leading to a status termed preintegration latency (46, 47). Under these circumstances, the unintegrated provirus is labile and rapidly degraded (half-life of ∼2 days), suggesting that infection of resting CD4+ T cells is unlikely to play a role in long-term viral persistence (48). In the system reported by Hirsh and colleagues (49), resting cells were generated after depletion of residual activated cells 3 wk following PHA activation of CD4+ T cells infected in vitro with HIV-1. These cells displayed persistent viral production, possibly the consequence of continued addition of IL-2 in the culture medium to prevent cell death (49). Indeed, although these cells lacked cell surface expression of CD25, engagement of the intermediate-affinity IL-2R (formed by the β- and common γ- chains, CD122 and CD132) triggers intracellular signals that support cell activation and proliferation (50). In addition, monitoring of viral replication was limited to the first 4–7 days, while a longer resting phase might have shown waning viral replication. The in vitro model of HIV-1 latency we described here presents several advantages: 1) use of primary cells, 2) culture methods that recapitulate a wide array of stimuli at play in vivo, 3) compliance with both viral latency and cellular quiescence requirements, and 4) suitability to study mechanisms at play during both establishment and reactivation of latency. In addition, the observation of higher cell death rates within HIV-1-infected than uninfected cultures during secondary stimulation indicates that this culture system may provide a model to study the mechanisms of infected and uninfected bystander CD4+ T cell depletion following HIV-1 reactivation. Resting, latently infected cells present in vivo and in clinical samples have the distinctive feature of being true long-lived memory cells that cannot be faithfully generated in vitro with current technology. However, the quiescent, nonproductively infected cells we described here represent an advancement from current in vitro models and a better approximation of the in vivo situation, which may prove extremely valuable in advancing our understanding of HIV-1 latency. We thank Drs. Davide Zella, George K. Lewis, and Yongjun Guan for helpful discussions and Dr. Clara Lehmann for critical reading of this manuscript. We are especially grateful to Dr. Robert C. Gallo for continued support. ↵2 Abbreviations used in this paper: HAART, highly active antiretroviral therapy; MDCC, monocyte-derived dendritic cell; 7AAD, 7-aminoactinomycin D; SEB, staphylococcal enterotoxin B; CHX, cycloheximide; AZT, azidothymidine; FCM, flow cytometry; TCM, central memory T; FSC-H, forward scatter height; SSC-H, side light scatter height. Harper, M. E., L. M. Marselle, R. C. Gallo, F. Wong-Staal. 1986. Detection of lymphocytes expressing human T-lymphotropic virus type III in lymph nodes and peripheral blood from infected individuals by in situ hybridization. Proc. Natl. Acad. Sci. USA 83: 772-776. Chun, T. W., D. Finzi, J. Margolick, K. Chadwick, D. Schwartz, R. F. Siliciano. 1995. In vivo fate of HIV-1-infected T cells: quantitative analysis of the transition to stable latency. Nat. Med. 1: 1284-1290. Finzi, D., M. Hermankova, T. Pierson, L. M. Carruth, C. Buck, R. E. Chaisson, T. C. Quinn, K. Chadwick, J. Margolick, R. Brookmeyer, et al 1997. Identification of a reservoir for HIV-1 in patients on highly active antiretroviral therapy. Science 278: 1295-1300. Chun, T. W., L. Stuyver, S. B. Mizell, L. A. Ehler, J. A. Mican, M. Baseler, A. L. Lloyd, M. A. Nowak, A. S. Fauci. 1997. Presence of an inducible HIV-1 latent reservoir during highly active antiretroviral therapy. Proc. Natl. Acad. Sci. USA 94: 13193-13197. Wong, J. K., M. Hezareh, H. F. Günthard, D. V. Havlir, C. C. Ignacio, C. A. Spina, D. D. Richman. 1997. Recovery of replication-competent HIV despite prolonged suppression of plasma viremia. Science 278: 1291-1295. Finzi, D., J. Blankson, J. D. Siliciano, J. B. Margolick, K. Chadwick, T. Pierson, K. Smith, J. Lisziewicz, F. Lori, C. Flexner, et al 1999. Latent infection of CD4+ T cells provides a mechanism for lifelong persistence of HIV-1, even in patients on effective combination therapy. Nat. Med. 5: 512-517. Han, Y., M. Wind-Rotolo, H. C. Yang, J. D. Siliciano, R. F. Siliciano. 2007. Experimental approaches to the study of HIV-1 latency. Nat. Rev. Microbiol. 5: 95-106. Swain, S. L., J. N. Agrewala, D. M. Brown, D. M. Jelley-Gibbs, S. Golech, G. Huston, S. C. Jones, C. Kamperschroer, W. H. Lee, K. K. McKinstry, et al 2006. CD4+ T-cell memory: generation and multi-faceted roles for CD4+ T cells in protective immunity to influenza. Immunol. Rev. 211: 8-22. Bradley, L. M., L. Haynes, S. L. Swain. 2005. IL-7: maintaining T-cell memory and achieving homeostasis. Trends Immunol. 26: 172-176. Khaled, A. R., S. K. Durum. 2003. Death and baxes: mechanisms of lymphotrophic cytokines. Immunol. Rev. 193: 48-57. Margolick, J. B., D. J. Volkman, T. M. Folks, A. S. Fauci. 1987. Amplification of HTLV-III/LAV infection by antigen-induced activation of T cells and direct suppression by virus of lymphocyte blastogenic responses. J. Immunol. 138: 1719-1723. Zack, J. A., A. J. Cann, J. P. Lugo, I. S. Chen. 1988. HIV-1 production from infected peripheral blood T cells after HTLV-I induced mitogenic stimulation. Science 240: 1026-1029. Hermankova, M., J. D. Siliciano, Y. Zhou, D. Monie, K. Chadwick, J. B. Margolick, T. C. Quinn, R. F. Siliciano. 2003. Analysis of human immunodeficiency virus type 1 gene expression in latently infected resting CD4+ T lymphocytes in vivo. J. Virol. 77: 7383-7392. Lassen, K. G., J. R. Bailey, R. F. Siliciano. 2004. Analysis of human immunodeficiency virus type 1 transcriptional elongation in resting CD4+ T cells in vivo. J. Virol. 78: 9105-9114. Abdelwahab, S. F., F. Cocchi, K. C. Bagley, R. Kamin-Lewis, R. C. Gallo, A. DeVico, G. K. Lewis. 2003. HIV-1-suppressive factors are secreted by CD4+ T cells during primary immune responses. Proc. Natl. Acad. Sci. USA 100: 15006-15010. Beyer, M., J. L. Schultze. 2007. CD4+CD25highFOXP3+ regulatory T cells in peripheral blood are primarily of effector memory phenotype. J. Clin. Oncol. 25: 2628-2630. Sallusto, F., D. Lenig, R. Foster, M. Lipp, A. Lanzavecchia. 1999. Two subsets of memory T lymphocytes with distinct homing potentials and effector functions. Nature 401: 708-712. Rathmell, J. C., E. A. Farkash, W. Gao, C. B. Thompson. 2001. IL-7 enhances the survival and maintains the size of naive T cells. J. Immunol. 167: 6869-6876. Wang, F. X., Y. Xu, J. Sullivan, E. Souder, E. G. Argyris, E. A. Acheampong, J. Fisher, M. Sierra, M. M. Thomson, R. Najera, et al 2005. IL-7 is a potent and proviral strain-specific inducer of latent HIV-1 cellular reservoirs of infected individuals on virally suppressive HAART. J. Clin. Invest. 115: 128-137. Alcamí, J., T. Laín de Lera, L. Folgueira, M. A. Pedraza, J. M. Jacqué, F. Bachelerie, A. R. Noriega, R. T. Hay, D. Harrich, R. B. Gaynor, et al 1995. Absolute dependence on κB responsive elements for initiation and Tat-mediated amplification of HIV transcription in blood CD4 T lymphocytes. EMBO J. 14: 1552-1560. Pendergrast, P. S., N. Hernandez. 1997. RNA-targeted activators, but not DNA-targeted activators, repress the synthesis of short transcripts at the human immunodeficiency virus type 1 long terminal repeat. J. Virol. 71: 910-917. Lin, X., D. Irwin, S. Kanazawa, L. Huang, J. Romeo, T. S. Yen, B. M. Peterlin. 2003. Transcriptional profiles of latent human immunodeficiency virus in infected individuals: effects of Tat on the host and reservoir. J. Virol. 77: 8227-8236. Popovic, M., K. Tenner-Racz, C. Pelser, H. J. Stellbrink, J. van Lunzen, G. Lewis, V. S. Kalyanaraman, R. C. Gallo, P. Racz. 2005. Persistence of HIV-1 structural proteins and glycoproteins in lymph nodes of patients under highly active antiretroviral therapy. Proc. Natl. Acad. Sci. USA 102: 14807-14812. Brussel, A., P. Sonigo. 2004. Evidence for gene expression by unintegrated human immunodeficiency virus type 1 DNA species. J. Virol. 78: 11263-11271. Ruff, C. T., S. C. Ray, P. Kwon, R. Zinn, A. Pendleton, N. Hutton, R. Ashworth, S. Gange, T. C. Quinn, R. F. Siliciano, D. Persaud. 2002. Persistence of wild-type virus and lack of temporal structure in the latent reservoir for human immunodeficiency virus type 1 in pediatric patients with extensive antiretroviral exposure. J. Virol. 76: 9481-9492. Yeni, P. G., S. M. Hammer, C. C. Carpenter, D. A. Cooper, M. A. Fischl, J. M. Gatell, B. G. Gazzard, M. S. Hirsch, D. M. Jacobsen, D. A. Katzenstein, et al 2002. Antiretroviral treatment for adult HIV infection in 2002: updated recommendations of the International AIDS Society-USA Panel. J. Am. Med. Assoc. 288: 222-235. Romerio, F., M. N. Gabriel, D. M. Margolis. 1997. Repression of human immunodeficiency virus type 1 through the novel cooperation of human factors YY1 and LSF. J. Virol. 71: 9375-9382. Coull, J. J., F. Romerio, J. M. Sun, J. L. Volker, K. M. Galvin, J. R. Davie, Y. Shi, U. Hansen, D. M. Margolis. 2000. The human factors YY1 and LSF repress the human immunodeficiency virus type 1 long terminal repeat via recruitment of histone deacetylase 1. J. Virol. 74: 6790-6799. He, G., D. M. Margolis. 2002. Counterregulation of chromatin deacetylation and histone deacetylase occupancy at the integrated promoter of human immunodeficiency virus type 1 (HIV-1) by the HIV-1 repressor YY1 and HIV-1 activator Tat. Mol. Cell. Biol. 22: 2965-2973. Chun, T. W., D. Engel, S. B. Mizell, L. A. Ehler, A. S. Fauci. 1998. Induction of HIV-1 replication in latently infected CD4+ T cells using a combination of cytokines. J. Exp. Med. 188: 83-91. Moriuchi, H., M. Moriuchi, A. S. Fauci. 1999. Induction of HIV-1 replication by allogeneic stimulation. J. Immunol. 162: 7543-7548. Korin, Y. D., D. G. Brooks, S. Brown, A. Korotzer, J. A. Zack. 2002. Effects of prostratin on T-cell activation and human immunodeficiency virus latency. J. Virol. 76: 8118-8123. Brooks, D. G., D. H. Hamer, P. A. Arlen, L. Gao, G. Bristol, C. M. Kitchen, E. A. Berger, J. A. Zack. 2003. Molecular characterization, reactivation, and depletion of latent HIV. Immunity 19: 413-423. Shen, A., H. C. Yang, Y. Zhou, A. J. Chase, J. D. Boyer, H. Zhang, J. B. Margolick, M. C. Zink, J. E. Clements, R. F. Siliciano. 2007. Novel pathway for induction of latent virus from resting CD4+ T cells in the simian immunodeficiency virus/macaque model of human immunodeficiency virus type 1 latency. J. Virol. 81: 1660-1670. Folks, T. M., K. A. Clouse, J. Justement, A. Rabson, E. Duh, J. H. Kehrl, A. S. Fauci. 1989. Tumor necrosis factor α induces expression of human immunodeficiency virus in a chronically infected T-cell clone. Proc. Natl. Acad. Sci. USA 86: 2365-2368. Folks, T. M., J. Justement, A. Kinter, C. A. Dinarello, A. S. Fauci. 1987. Cytokine-induced expression of HIV-1 in a chronically infected promonocyte cell line. Science 238: 800-802. Antoni, B. A., A. B. Rabson, A. Kinter, M. Bodkin, G. Poli. 1994. NF-κB-dependent and -independent pathways of HIV activation in a chronically infected T cell line. Virology 202: 684-694. Jordan, A., D. Bisgrove, E. Verdin. 2003. HIV reproducibly establishes a latent infection after acute infection of T cells in vitro. EMBO J. 22: 1868-1877. Han, Y., K. Lassen, D. Monie, A. R. Sedaghat, S. Shimoji, X. Liu, T. C. Pierson, J. B. Margolick, R. F. Siliciano, J. D. Siliciano. 2004. Resting CD4+ T cells from human immunodeficiency virus type 1 (HIV-1)-infected individuals carry integrated HIV-1 genomes within actively transcribed host genes. J. Virol. 78: 6122-6133. Swiggard, W. J., C. Baytop, J. J. Yu, J. Dai, C. Li, R. Schretzenmair, T. Theodosopoulos, U. O'Doherty. 2005. Human immunodeficiency virus type 1 can establish latent infection in resting CD4+ T cells in the absence of activating stimuli. J. Virol. 79: 14179-14188. Saleh, S., A. Solomon, F. Wightman, M. Xhilaga, P. U. Cameron, S. R. Lewin. 2007. CCR7 ligands CCL19 and CCL21 increase permissiveness of resting memory CD4+ T cells to HIV-1 infection: a novel model of HIV-1 latency. Blood 110: 4161-4164. Zack, J. A., S. J. Arrigo, S. R. Weitsman, A. S. Go, A. Haislip, I. S. Chen. 1990. HIV-1 entry into quiescent primary lymphocytes: molecular analysis reveals a labile, latent viral structure. Cell 61: 213-222. Pierson, T. C., Y. Zhou, T. L. Kieffer, C. T. Ruff, C. Buck, R. F. Siliciano. 2002. Molecular characterization of preintegration latency in human immunodeficiency virus type 1 infection. J. Virol. 76: 8518-8531. Siliciano, J. D., R. F. Siliciano. 2004. A long-term latent reservoir for HIV-1: discovery and clinical implications. J. Antimicrob. Chemother. 54: 6-9. Gondois-Rey, F., A. Biancotto, M. Pion, A. L. Chenine, P. Gluschankof, V. Horejsi, C. Tamalet, R. Vigne, I. Hirsch. 2001. Production of HIV-1 by resting memory T lymphocytes. AIDS 15: 1931-1940. Lin, J. X., W. J. Leonard. 2000. The role of Stat5a and Stat5b in signaling by IL-2 family cytokines. Oncogene 19: 2566-2576.